Empire Steam Engines were made by the Metal Ware Company, Two Rivers, Wisconsin, USA, Between 1920 and the mid-1960s. 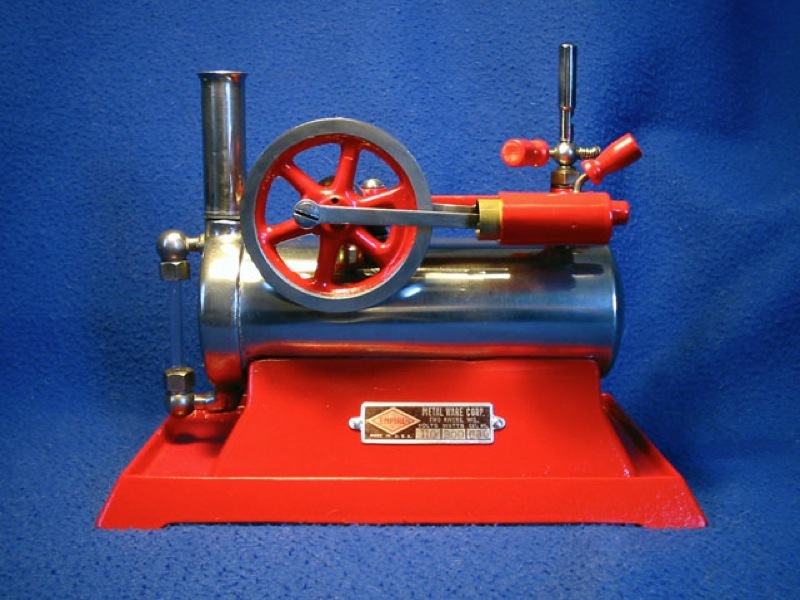 Empire engines can actually be found under a great variety of names and brands, as they made "educational toys" under license. Therefore, you may find similar or identical looking engines by Elektro, Raven, Ind-X, Quality Brand, and, in the UK, Hotpoint (and probably quite a few more). They made quite a range of engines, and undoubtedly the most attractive ones are the heavy cast iron B-30, its vertical twin the B-31, a slightly bizarre Turbine B-35, and the twin cylinder B-42: essentially a double B-30, with twin boilers, twin heaters and twin throttles! These engines are incredibly well built, incorporate electric heating, and many survive well to this day. 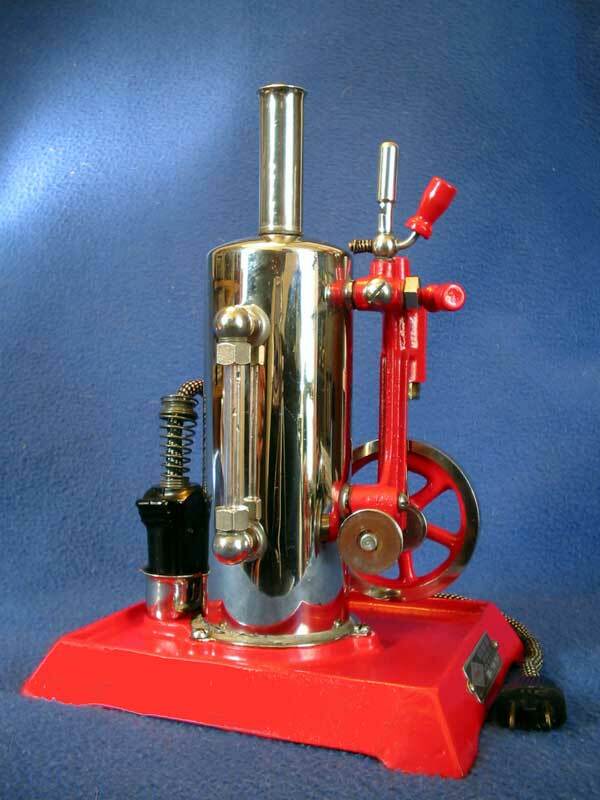 They also made a range of less solid tinplate engines, some nice driving accessories, and a range of toy stoves, popcorn makers, hotdog warmers etc. The Metal Ware Company survives to this day, and still makes a range of electric domestic appliances. For detailed information on Empire engines, I suggest you consult Don Stilson's book, readily available on EBay, or IndianaRog's website. There is quite a story attached to this engine, so I'll start with some factual information. The B-30, possibly Empire's most popular engine, was made between 1921 and 1941. My particular model probably falls nicely within this period, and probably dates from the mid-thirties. 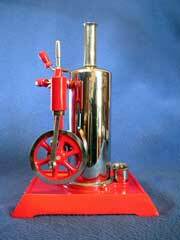 It comprises a drawn copper nickel-plated boiler, mounted on a cast iron bed, which incorporates a 300W heating element mounted to the boiler. 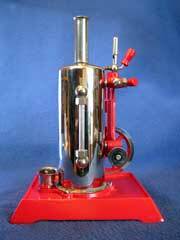 The boiler endcap accommodates a large sightglass and a chimney/safety valve combination. 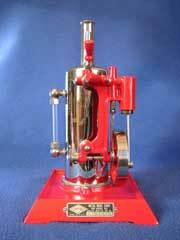 The engine frame is brass, with a brass cylinder and slide valve and plated steel conrods. The flywheel is plated and painted cast iron. The engine features a (very loud!) whistle, throttle and take-off pulley. Bore is approx 3/4 inch with a 1 inch stroke, and the engine weighs just under 7 lbs. Right! Now for the fun bit! After a couple of weeks casting about, a suitable candidate was found in Ray Ellen's Toys of the Past (wonderful online shop for American vintage toys). The price was right, so the engine was swiftly procured and shipped to Indiana. There it was discovered that the sightglass was broken (no big deal), and the heating element completely missing - VERY big deal, as you can't just go and buy a replacement as you can with Jensen. Ray Ellen, being a great guy and a true gentleman, immediately offered a full refund even though the engine was "sold as seen", but between us Rog and I decided that we'd hang on to it. Roger then dove into his records, as he'd remembered seeing someone who made replacement heaters. For reasons that will become obvious, this person will remain nameless. Roger contacted him, agreed a price for two elements, sent of a cheque and waited...and waited....and waited. Even after a couple of gentle reminders nothing was forthcoming. Eventually (after 4 months) we found out that this person probably had become offended at the fact that Roger actually expected something in return for his money that he'd decided to cut us dead. End of story. Needless to say we won't be dealing with him again. Well, the heater worked....almost! The fact that a reading across the terminals came up somewhere in the order of 100 Ohm was at least hopeful. Roger then proceded to disassemble the entire heater, gently cleaning the delicate little nichrome wires, and put the whole thing back together. It now clocks up 33 Ohm - exactly what it should be. We now had a working engine! For a quick encore, Rog then proceeded to pull of an astonishing bit of forgery: the engine was missing its tag, and Roger made one up out of a redundant Jensen tag and some other bits and pieces. If you want to know how it was done, drop me a line and I'll put you in touch so Rog can tell you himself. Suffice to say that you'd have to look VERY close to notice that it isn't the real thing. After all that, the engine was shipped to me. And my contribution to all this? I polished and painted it, that's all. This restoration/resurrection is an unadulterated IndianaRog masterpiece, and I take only a small cosmetic credit for it. What's the engine like to run? Well, if the Jensen #5 is a racehorse, this is a Lippizaner high-stepper - a real parade horse of an engine. Not the world's fastest runner, but incredibly steady, with a lovely exhaust tone, and that great big cylinder thumping away is a sight to behold - I will add video ASAP. With a voltage regulator (another IndianaRog original, which I will describe elsewhere on the site), I can trim this engine right down to about 100rpm, and it is absolutely hypnotic - it will then also run for the better part of an hour on one boiler filling. This engine's had one heck of a journey, and is now safe and cherished in the House of Moose, from where it will never leave again! Soooo....I may have gone slightly overboard on the amount of pictures of this engine, but I am just smitten with the looks of it. In my opinion this just looks good from any angle, and who am I to deprive you, dear reader, of a full view of this beauty. This is the B-31, the vertical counterpart of the B-30. 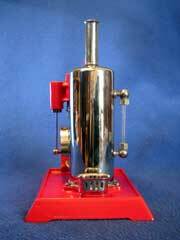 The boiler and base are different, but the engine is absolutely identical and, in fact, interchangeable. The difference is that the engine on the B-31 has a tapped hole for the whistle on the top of the frame, the B-30 has it on the side. Counterparts are simply blanked off. The heater on the B-31 is marginally more powerful, to compensate for a smaller contact area. This engine was made between 1921 and 1931, and mine falls nicely in the middle, so I'd say mid to late 'twenties - which also makes it the oldest "dateable" engine in my collection! This engine came to me through the good services of.....you guessed it, IndianaRog, the Guardian Angel of US engines! Rog had managed to haul it in off EBay at a VERY reasonable price, and offered me first refusal on it - needless to say, it took me about 0.34 seconds to make my mind up. I know the progeny of this engine, but I make it a habit never to publish anyone's full name and story without their explicit permission (so Ms. Karen B., if you read this and you'd like to see the story of this engine printed, please drop me a line). This engine came in its original cardboard box and was in very good condition - it had obviously been carefully stored, as it was just dusty - not a trace of rust or tarnish. Just a few gaskets were perished - Rog did the sightglass, I did the rest. Even the paint was still in a presentable state, just some chipping and shrinking here and there. BUT, I had already restored the B-30 to parade standard, and I didn't want the B-31 to look tired in comparison. So what you see is the engine after a repaint and a polish, and I think we can safely say that this one's literally as good as new - quite unbelievable that this engine's actually about 80 years old. How does it run? Well, every bit as good as the B-30 and maybe even a little better. I find that vertical engines always have something a little special - maybe it's gravity helping out, I don't know, but they're a class apart. With the aid of the "Juice Reducer" I can throttle this engine right down to a slow, steady tickover. Another point of interest: this one has the original nametag, the B-30 one's a clever fake! Can you tell the difference? I can't! If you have an electric Jensen, and you live in the US, you're laughing. However, elsewhere you'll have to convert your mains voltage (for us Brits 240V) to the American 110-120V standard. Do NOT be tempted to just plug it in anyway - you will fry your heater, and possibly your engine. You're right, of course. The big transformer is the only way to go: it will properly convert your voltage down. 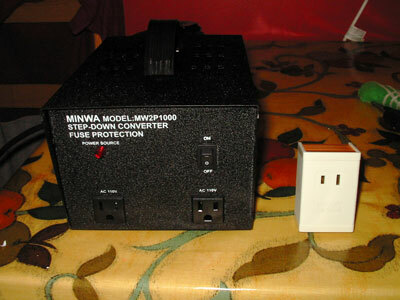 This one's rated at 800W continuous use, and can sustain peaks of 1000W. It cost me £60, which seems a lot of money, but remember that I use it to power a treasured and valuable toy. The problem with the travel adapter is that it doesn't really lower your voltage. It uses a component called a Triac (also found in solid state mains dimmer), and what this basically does is to switch the power off half of the time. The effect is roughly the same, if you're a lightbulb! It does work, and it does power the engine, but it gets very hot, and you can hear the heater element buzzing away...typical dimmer noise (BTW, I'm no electronics expert....somebody will correct me if I'm wrong). It really is only intended for short-term use.